The early phases of many construction projects involve the demolition of concrete foundations, sidewalks, driveways, and other concrete structures, which can leave a contractor with a sizable volume of heavy, dense materials to deal with. Fortunately, concrete can be recycled and reused in many ways. 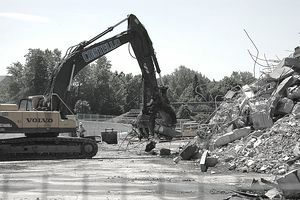 Typically (but not always) the process involves crushing or pulverizing the concrete rubble near the demolition or building site. Choosing the best method often depends on the size and shape of the concrete pieces to be recycled. Reusing concrete can a good way to reduce construction costs while providing some benefits to the environment. Recycled concrete not only stays out of landfills, but it also replaces other materials such as gravel that must otherwise be mined and transported for use. Recycling concrete helps reduce construction waste and extend the life of landfills as well as saving builders disposal or tipping fees. It also reduces transportation costs because concrete can often be recycled in areas near the demolition or construction site. If builders are seeking LEED Green Building certification, they can receive points for using recycled concrete. In some instances, new employment opportunities arise in a recycling activity that would not otherwise exist. Concrete is recycled by using industrial crushing equipment with jaws and large impactors. After the concrete is broken up, it is usually run through a secondary impactor and is then screened to remove dirt and particles and to separate the large and small aggregate. Additional processes and equipment, such as water flotation, separators, and magnets, may also be used to remove specific elements from the crushed concrete. An alternative method is to pulverize the concrete, but this is not the always the best option, as it makes it harder to complete the separation process and may leave more contamination from smaller byproducts. Equipment should have a powerful electromagnet or water flotation or an air separator system that can pull steel from concrete. Separate hydraulic stands will allow for a faster setup. Control systems may be automatic, manual, or remote. Systems that have conveyors, jaws, and cones can provide complete processing of the concrete, from demolition to a usable material. Recycled concrete can be used in many of the same ways as you would use new materials, such as gravel, paving materials, and aggregates. Permeable paving for walkways, driveways, and other outdoor hard surfaces: Broken concrete that is carefully laid creates a stable, porous traffic surface that rainwater can filter through. This technique reduces the amount of runoff water that must be managed by storm sewer systems and helps to replenish groundwater. Base for new asphalt paving: Through a process called rubblization, old concrete pavement can be broken in place and used as a base layer for asphalt pavement laid over it. Bed foundation material for trenches containing underground utility lines: Utility trenches are oven covered with gravel to assist drainage, and crushed concrete makes a good, inexpensive substitute for gravel. Aggregate for mixing new concrete: Crushed concrete can replace some of the virgin (new) aggregate used in ready-mix concrete. Controlling streambank erosion: Larger pieces of crushed concrete placed along vulnerable stream banks or gullies can help control erosion. Landscaping mulch: When properly crushed and well sorted, ground concrete can replace river rock or other gravels used as ground covers and mulch. Fill for wire gabions: Wire cages (gabions) filled with crushed gravel can make decorative and functional privacy screen walls or retaining walls. Material for building new oceanic reef habitats: Large pieces of concrete carefully positioned offshore can form the foundation for coral to build new reefs.